New Delhi: While addressing the Union Budget2016-17 in the Parliament Finance Minister Arun Jaitley on Monday listed out ‘nine pillars’ including tax reforms, education and job creation, social sector, agriculture, infrastructure, promoting governance and ease of doing business and ensuring fiscal discipline, that will transform India. Out of the nine areas outlined by Jaitley rural development took the top slot. “I am presenting the budget when the global economy is in crisis,” Arun Jaitley said in his opening remarks, adding that India, however, remained the bright spot in this gloom, turning difficulties into opportunities. Arun Jaitley said his budget will look at three pillars in right earnest: A prudent fiscal policy, raise domestic demand and carry out reforms. He also said farm, rural sector, infrastructure and social sector will be allotted more money. “Recapitalization of banks also to be done during next fiscal year,” he said, as much concern have emerged over the quantum of exposure of Indian scheduled banks in terms of gross non-productive assets, re-cast loans and write-offs, which amounts to Rs.9.5 lakh crore. He said the nine pillars of this year’s budget will be: agriculture, social programmes, rural development, education with skill development, infrastructure, financial reforms, policy reforms in terms of ease of doing business, fiscal discipline and tax reforms. “A unified agriculture platform to be dedicated to the nation on the birth anniversary of Dr.B.R. Amebdkar,” the finance minister said, amid applause from the benches. He said the government had targeted agriculture credit of Rs.8.5 lakh crore in 2015-16, which was being enhanced to Rs.9 lakh crore in the next fiscal. He also said Rs.19,000 crore will be allocated for rural roads development programme. Overall, Rs.87,765 crores was being allocated for rural development as a whole. At the same Rs.35,984 crore was being allocated for agriculture in the next fiscal. This apart, the outlay under the job guarantee programme was being enhanced to get Rs.38,500 crore. 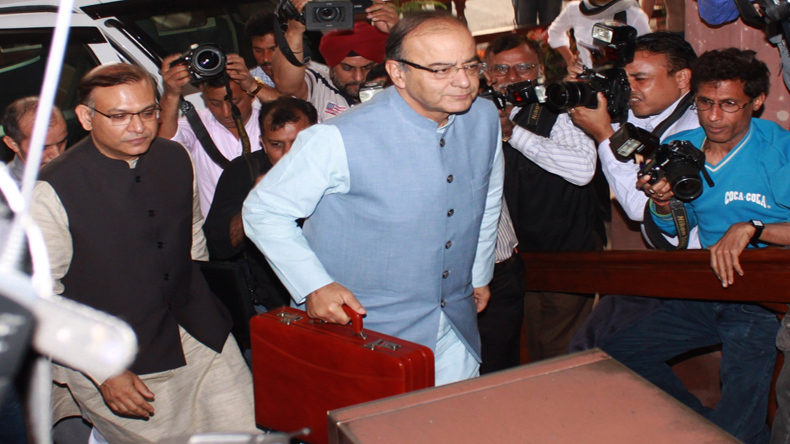 These enhanced allocations are capable of transforming villages and towns, Arun Jaitley said. He said there was also the need to spread digital literacy in rural areas. In addition, he added, Rs.8,500 crore was being allotted towards rural electrification, targeting 100 percent rural electrification by May 1, 2018. Arun Jaitley also assured that the government intended to double the income of farmers in five years, besides allotting Rs.35,984 crore towards welfare of farmers. The proposals also included universal coverage of cooking gas in the country, with a massive mission towards this aimed at the poor people. On health, he said, a new scheme will provide cover upto 1.lakh per family.